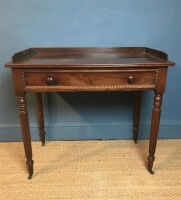 A Regency mahogany side table circa 1820 in the manner of Gillows in lovely original condition with three quarter gallery and single frieze drawer on turned legs brass cappings and castors. 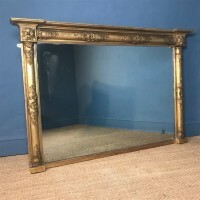 A large George IV gilt overmantel Mirror circa 1830 in lovely original condition with water gilding and hand silvered mercury plate . 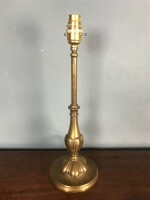 An Edwardian brass column lamp circa 1905 on turned base. 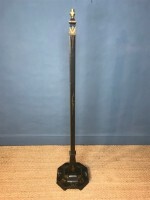 12.5 inches wide 72 inches high. 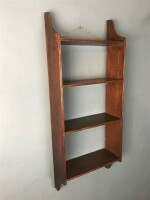 A rare mid 18th c West Country Pine dressed base Devon circa 1740. 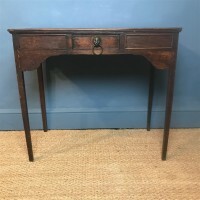 It is extremely unusual to find a dresser base of this date in pine especially retaining its original patination. 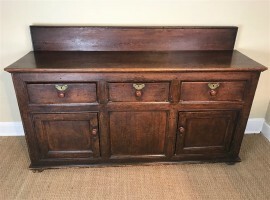 Original escutcheons and 19th c fruitwood knob handles . 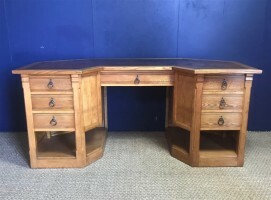 72 inches wide 22 inches deep 36 inches high. 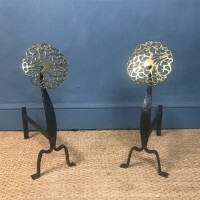 A pair of Arts and Crafts brass and wrought iron fire dogs or andirons circa 1910 in the. 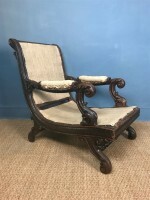 style of Alfred Bucknall. 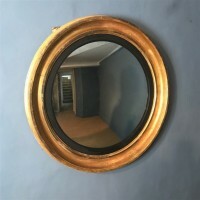 An unusual George IV convex mirror circa 1825 with original water gilding and hand silvered mercury plate. 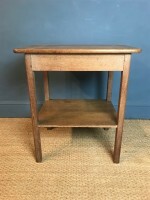 An Arts and Crafts ash oak pedestal desk circa 1910 of unusual form with the original brown tooled leather. 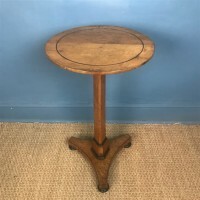 An Aesthetic Movement oak 2 tier table circa 1880 designed by Charles Eastlake. 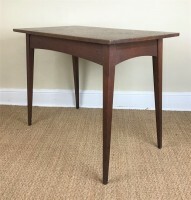 27 inches wide 18 inches deep 30 inches high. 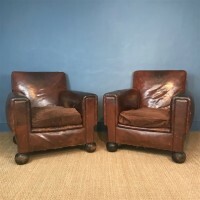 A pair of English leather club or library chairs by Cowleys circa 1930 in lovely old original leather with the original velvet cushions. 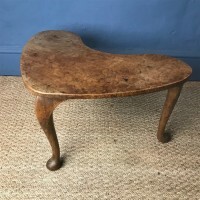 Willaim Cowley have been since 1870 and still are bespoke leather makers based in Newport Pagnell. 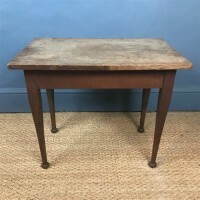 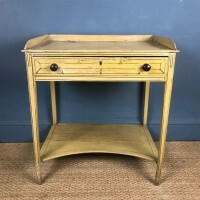 A George 111 oak side table circa 1820 with a crossbanded top and single frieze drawer on square tapering legs. 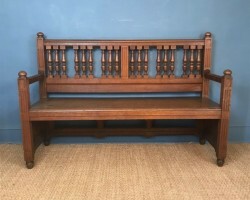 A pair of Aesthetic Movement oak benches circa 1890 in the style of George Faulkner Armitage in excellent solid condition with warm original patina. 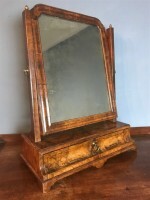 A George 11 walnut swing frame toilet mirror circa 1745 by James Jenkins The Strand London in lovely original condition with a wonderful makers label to the back . 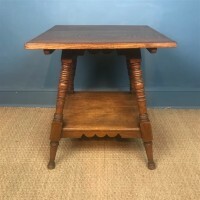 A Waring and Gillows limed oak 2 tier table circa 1920 in the style of Heals. 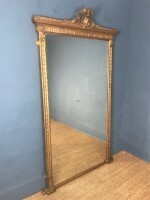 A large Victorian gilt pier mirror circa 1880 with the original gilding and silver mercury plate. 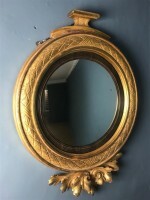 Read more: A large Victorian gilt pier mirror circa 1880 with the original gilding and silver mercury plate.